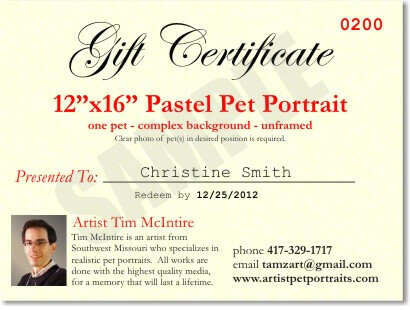 Pet portrait gift certificates are great for any occasion, and can be ordered almost literally down to the last minute. If you don’t have time to wait for free shipping, I can email you a printable version, or the certificate can be electronically delivered directly to the recipient. As with regular projects, I accept major credit cards and PayPal as well as checks. inquiry. I will typically follow up with you the same business day. You may also email me directly at tim@tamzart.com, or call 417-298-6584. If you’re comfortable signing off on the choice of size and media, you can relieve the recipient of that decision by purchasing a spec certificate. This type of certificate doesn’t show a price, but only size and specifications, e.g. “12 x 16 pastel, 2 pets, basic background.” Should the client later want to revise those specs, arrangements can of course be made. If you’re unsure what the recipient would prefer in the way of size and media, you can order a dollar-value gift certificate in the amount of your choice. The pet owner can then put this toward any size and medium they desire. It all starts with an inquiry.